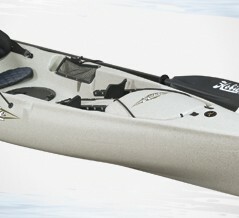 Redesigned for 2011, the Hobie Odyssey is the perfect family oriented, go-anywhere, do-anything paddle kayak. Featuring a long, sleek waterline, a stable hull, great tracking and the ability to haul 540 pounds ? plus plenty of ondeck gear storage ? the Odyssey opens up worlds of fun. 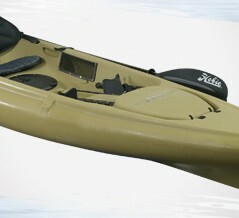 While this fully redesigned hull accommodates two, it can be paddled by one using the molded-in center-seat position. Or, this center-seat area can be used to tote along a junior crew member, extra gear or even the family hound. 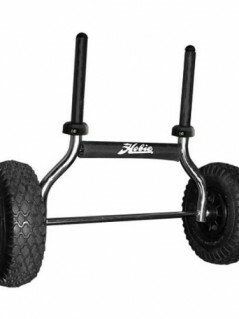 Height is the maximum height of the boat at any location, while it is laying flat on the ground. Fitted Hull Weight: includes all standard features that are permanently attached, e.g. hatches, handles, rudder, hardware. Fully Rigged Weight: includes all standard features that are permanently attached, plus all other standard features that are removable, e.g. 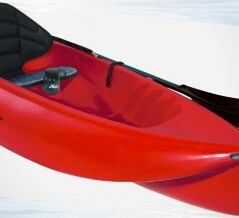 MirageDrive, seat, paddles, gear bucket, water bottle, cassette plug, PA (removable liner), Islands (sail, amas, akas, daggerboard).